Comment: I have a sulfur odor coming from my bathroom faucet in my condo. I have ran the line several times, and it is still happening. It appears to be in the water as I can smell the sulfur on my skin after I wash my hands. In addition, I have a slow drain. The bathroom (same bathroom) sink drain is slow. Comment: I have a whole house water filter/softener and an RO undersink filter I need installed. Comment: Connect an Apec water filter to refrigerator water line. Unfinished basement just below refrigerator. Comment: I live in a one year old house, and I can see the signs of hard water on my shower door, and my faucets as well as my skin. Before the house gets too old I would like to take care of the hardness. Comment: My water seems to leave white stains on everything, almost like chalk. My skin has also been breaking out since moving in making me think the water is hard. Looking into the cost of a system fix vs just trying a new shower head for now. Denver Water Treatment Companies are rated 4.63 out of 5 based on 1,642 reviews of 19 pros. 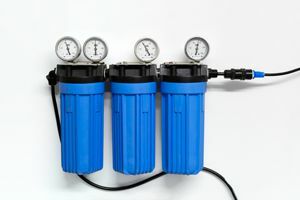 Not Looking for Water Treatment System Contractors in Denver, CO?